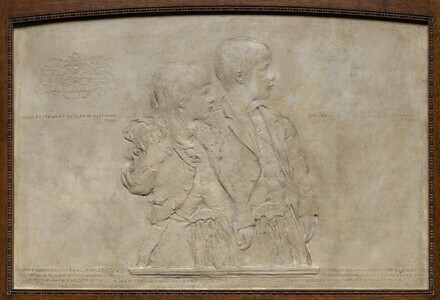 Rendered in a delicate, shallow bas-relief, these two young brothers wear Scottish kilts and sporran pouches. Six-year-old Lawrence Smith Butler embraces four-year-old Charles Stewart Butler, who tenderly clasps the older boy's hand. As recorded in a beautifully lettered dedication below their profile figures, the work was modeled from October 1880 to March 1881. Augustus Saint-Gaudens made this dual portrait as a favor to his friend, the architect Stanford White, who in 1884 was to marry the boys' aunt. White presented a bronze relief to Prescott Hall Butler, the boys' father, a prominent New York attorney. Saint-Gaudens cast this plaster version as a memento for White. Behind the brothers, a ribbon interlace contains a comforting Latin verse from Virgil's Aeneid: "God will give an end to these bad times." The reasons for including this text alluding to a difficult time for White, Butler, or the children remain a mystery today, but must have been understood by the relief's first audience. Gift 1881 from the sculptor to Stanford White [1853-1906], Saint James, Long Island; by inheritance to his wife, Bessie Smith White [d. 1950]; by inheritance to their son, Lawrence Grant White [1887-1956]; by inheritance to his son, Peter White [b. 1917]; gift between 1956 and 1971 to the nephew of the sitters, William Reed Huntington [1907-1990]; gift 1971 to his children; gift 1983 to the Parrish Art Museum, Southampton, New York; deaccessioned and sold 25 May 1990 through (Hirschl and Adler Galleries, New York) to NGA. Information on the history and descent of the relief and its frame within the Butler family, as well as the text of Stanford White's letter to Prescott Butler, was provided by one of the granddaughters of Susan Butler Huntington, who was the sister of Charles Stewart Butler and Lawrence Smith Butler. Biographical information on the two sitters is published in obituaries in The New York Times: for Lawrence S. Butler (1875-1954) on 27 March 1954: 17, column 6; for Charles S. Butler (1876-1954) on 27 October 1954: 29, column 5. Another Butler family member provided the birthdates of the sitters, and Thayer Tolles (Assistant Curator, American Paintings and Sculpture, The Metropolitan Museum of Art, New York) provided copies of the obituaries (now in NGA curatorial files). Primary Models: American Plasters 1880-1940, Hirschl & Adler Galleries, New York, 1990, no. 4, repro. Menconi, Susan. Primary Models: American Plasters 1880-1940. Exh. cat. Hirschl and Adler Galleries, New York, 1990: 10-11, no. 4, repro. National Gallery of Art. 1990 Annual Report. Washington, D.C., 1991: 2, 14, repro. 74. Sculpture: An Illustrated Catalogue. National Gallery of Art, Washington, 1994: 213, repro. Butler, Ruth, and Suzanne Glover Lindsay, with Alison Luchs, Douglas Lewis, Cynthia J. Mills, and Jeffrey Weidman. European Sculpture of the Nineteenth Century. The Collections of the National Gallery of Art Systematic Catalogue. Washington, D.C., 2000: 454-459, color repro.